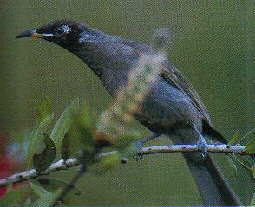 The Bridled Honeyeater is endemic to the Wet Tropics region . The name relates to the brown and yellow bridle that stretches from the beak to under the bright blue eyes. It also has a blue eye area. Their call can be described as 5 clear downward notes. It occurs mainly in upland rainforests, at all altitudes above 450m, but mostly above 600m. In winter it extends to lower altitudes and more open habitats. Besides living in rainforests, it likes swamp woodlands and drier forests adjacent to rainforests. They are usually seen alone, but sometimes in pairs or small groups. Its closest relative is the Eungella Honeyeater near Mackay, which was thought to be the same species until it was distinguished as separate in 1977. This bird can be quite aggressive, especially during the breeding season from August to March when they can be seen attacking each other. They sometimes can be seen grappling with each other and tumbling down to the forest floor. They feed on nectar (especially from the mistletoes, Climbing Pandans and Umbrella Tree), beetles and other insects, generally from the mid strata of the rainforest. Near Chambers Wildlife Rainforest Lodge it is observed most readily in the Lake Eacham picnic area. A population hangs around the mangroves adjacent to the mangroves in the Daintree lowlands, where their fights and antics can sometimes make the bird very obvious.